Kokanee Crankworx Pushes Technical Progression off the Mountain with Mobile App Designed by Quickmobile Inc.
Whistler, BC July 13, 2011 – Kokanee Crankworx is excited to reveal their mobile events app for all smartphones developed by QuickMobile. The app will give users access to important festival specific information like event schedules, updated results, area maps and venue information, all in the palm of their hand. 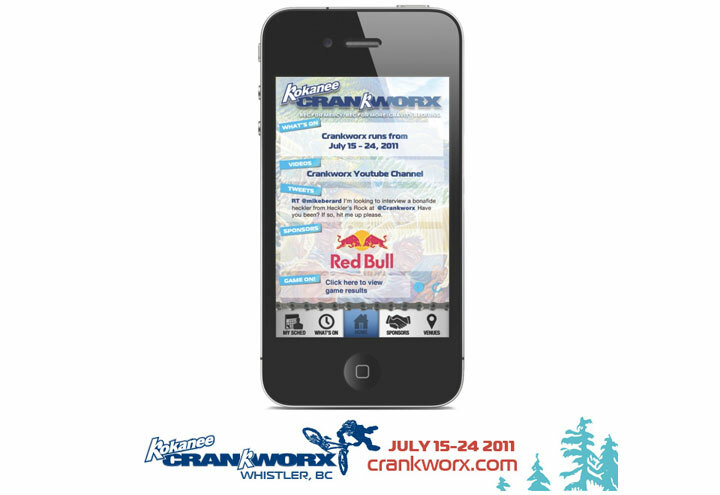 The Kokanee Crankworx 2011 Mobile App is available for iPhone on iTunes and in the Android Marketplace for Android handsets on July 12. The comprehensive app features video, Twitter, sponsors, venue maps as well as other useful functionalities such as personalized itineraries, event results and press releases. For all other smartphone users, there is a mobile website that provides access to many of the same features as the mobile apps. The Crankworx 2011 Mobile App does not only provide visitors with crucial event information right at their fingertips, but also allows for personalization, interactivity and fun. Features such as “My Schedule,” “Social Hub,” “Polling“ and “Game On,” a fully interactive game complete with a leaderboard for daily prizes as well as a grand prize of VIP access at the at the Garibaldi Lift Co. during the Red Bull Joyride event for the user with the most cumulative points by July 23. These features provide great opportunities to engage, captivate and interact before, during and after Kokanee Crankworx. Stay tuned to www.crankworx.com for upcoming news and connect with Crankworx through Facebook.com/crankworx or Twitter.com/crankworx.